According to the law in many jurisdictions, companies are required to complete a yearly review of potential risks of workplace violence and safety. The WPV Risk Assessment App™ satisfies the yearly legislation requirements and provides you with a detailed assessment of your organization in an easy cost-effective way. Provide a baseline from which to track the organization’s violence risk profile. A pyramid has no opposites, where each side effects the other. A pyramid provides a strong foundation to build a solid structure. Each element interacts and supports the other sides. That means that a weak area can undermine the entire organization. By measuring and exploring each element of the pyramid, you can understand and identify potential issues relating to violence and bullying behavior that may exist within your organization. 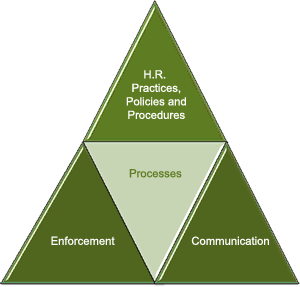 The Processes and Procedures Triangle: This assesses whether the organization has a a zero tolerance policy toward workplace violence and other human resource policies and procedures in place that are required under the law? Are the policies properly enforced throughout the organization? Do people know about the zero tolerance policy and is it properly communicated throughout the organization? The Culture Triangle: Does leadership set an example with regards to workplace violence and safety? Are people either rewarded for positive behavior or proportionately punished for unacceptable behavior? Do the organization’s unwritten attitudes and behaviors encourage or discourage inappropriate behavior such as degrading jokes or cliques. The Workplace Triangle: Is the physical environment safe or are there dangers from things like hazardous waste materials or insufficient lighting? Many employees are required to go to an external environment for client visits. Is there unacceptable risk when visiting client sites? Is there emotional safety internally when people are stressed or dealing with issues such as illness? Do people feel emotionally safe raising issues of concern with regards to workplace safety or do they feel they will be punished? The Supports Triangle: Are there physical supports in place such as security or maintenance that people can go to when they feel that they are physically at risk? Are there emotional supports that people can utilize when they are feeling stressed or are going through a difficult period? Is there compliance training in place so that people understand what is workplace violence, what to report and what to do if they are confronted with a dangerous situation? The report uses 3 colors to assess each area of the triangle . Management will receive a detailed report on the findings of the instrument. After they receive the report they will receive a free consultation with their internal consultant. The consultant will review the report with management and answer any questions about the report’s findings and recommended actions.